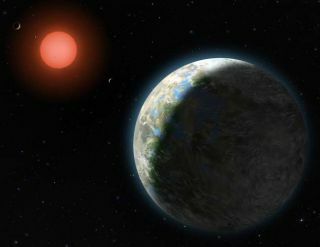 The 500th alien world appears to have been discovered, according to extrasolar planet trackers. Less than 20 years after confirming the first planet beyond our own solar system, astronomers have bagged exoplanet No. 500. The milestone was reached Friday (Nov. 19), according to the Extrasolar Planets Encyclopedia, a database compiled by astrobiologist Jean Schneider of the Paris-Meudon Observatory. As of today (Nov. 22), the count stands at 502 alien worlds, the database reports. The 500th extrasolar planet was reported in the midst of the discovery of several others. And there's always the risk a previous discovery turns out to be a false alarm, dropping the count. For such reasons, it makes little sense to permanently anoint one particular world as "exoplanet 500," Schneider told SPACE.com. That being said, the 500th alien planet currently appears to be one of four newfound extrasolar worlds, based on Schneider's list. They appear on the list just after another extrasolar planet, HIP 13044 b, which astronomers announced last week to be from an alien galaxy. All of the newfound planets are less massive than Jupiter (they range between 15 and 50 percent of Jupiter's mass), and the planets' distances from Earth range from 58 light-years to 196 light-years. The find comes less than two months after another watershed moment — the discovery of the first potentially habitable extrasolar planet. And astronomers are sure to hit other big milestones soon, as data rolls in from instruments like NASA's planet-hunting Kepler space observatory. "In some sense, 500 is an artificial milestone," said Jon Jenkins of the SETI (Search for Extraterrestrial Intelligence) Institute. Jenkins is the analysis lead for the Kepler mission. Astronomers aren't just discovering scorching-hot gas giants anymore, he added. They are finding smaller, rocky worlds, too — planets that could be a lot like Earth. An official alien planet count? The International Astronomical Union, the body that assigns official designations to celestial bodies, does not keep an official list of extrasolar planets. Instead, there are only unofficial lists like those maintained by Schneider and NASA's Jet Propulsion Laboratory, which keeps a count called "PlanetQuest: New Worlds Atlas." As of today, PlanetQuest lists 497 planets. The difference between the two lists underscores the uncertainties involved in exoplanet detection and confirmation. The boundary between confirmed and unconfirmed planets remains somewhat fuzzy, Schneider said, so he hesitates to hand the mantle of "alien world number 500" to one particular planet. "'The' 500th planet makes no sense," Schneider said. But the numbers are pretty solid, he added. And they will continue to rise, and fast. Kepler has already identified more than 700 "candidates" — stars possibly harboring alien planets — that await further observation and confirmation. A high percentage of these will probably pan out, according to Jenkins. "Our false positive rate continues to be rather low," he said. "It appears to be below 20 percent." Some of these alien stars will likely host more than one planet, as multi-planet systems appear to be somewhat common. So it certainly won't take 20 more years to find exoplanet number 1,000. But the search for exoplanets isn't really about numbers, astronomers say. It's about gaining a better understanding of the nature and diversity of alien worlds in our galaxy and beyond, Jenkins said. That's beginning to happen. And astronomers' knowledge will only grow as the exoplanet finds continue to pile up. "We're starting to see the family portraits of these extrasolar systems," Jenkins said. "We're getting a more complete picture of the distribution and frequency of planets beyond our solar system."